Queensland Fire and Emergency Services Commissioner, Katarina Carroll, from left, Queensland Premier Annastacia Palaszczuk and Queensland Police Deputy Commissioner Bob Gee discuss the approaching cyclone at the Emergency Services Complex in Brisbane, March 19, 2019. 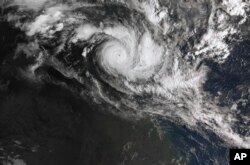 An emergency was declared in communities along the western Gulf of Carpentaria where Trevor is expected to make landfall Saturday, Northern Territory Chief Minister Michael Gunner said. In a satellite image acquired from the Australian Bureau of Meteorology, Cyclone Trevor moves over the Northern Territory captured at 0810am AEDT, March 19, 2019.